As a second-tier market, Las Vegas generally has buildings trade at meaningfully higher cap rates than major markets like Los Angeles. However, the area is receiving both high net-worth and some institutional interest. In multifamily, which remains a popular asset class, cap rates have been as low as 4.20% on an acquisition basis. Despite this regionally low cap rate, investors are expecting rents to continue to grow. There are over a dozen projects with an excess of 300 units that have traded in 2018 to date. One of the highlights of 2018 so far is The Wolff Company’s sale of Castile in Henderson. The 498 unit project sold for $99.6 million and was delivered in 2017. The complex was 90% occupied at the time of sale, so the going-in cap rate of 5.25% likely reflects some upside potential in occupancy and rent growth. 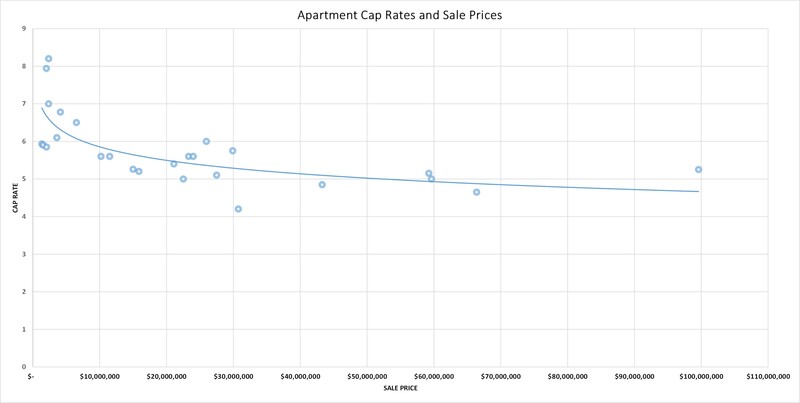 Below is a simple chart which provides some expectation of what you cap rates you can observe for different asset price levels in the Las Vegas Valley. Source: Costar, Coldwell Banker Premier Realty.